Jordan is a country with limited and fragile land resources where more than 90 % of the country’s lands are arid to semiarid and receive low rainfall amounts. As a result most of the country’s land, known as the Badia, is used as an open rangeland for the herds of the local tribes of the Badia. Although the country is blessed by the political stability and security which provide a good floor for investment, however the country has been always affected by the political instability, wars and civil unrest in the region. The Gulf Crisis of 1990-1991 resulted in a severe damage to the environment for the surrounding countries, particularly Jordan. It was estimated that influx of refugees brought 1.8 million sheep and goats to Jordan in the aftermath of the crisis and resulted in damage to the terrestrial ecosystems of the Jordan’s Badia. The influx of refugees in such large numbers to the north-eastern Badia was the main cause that led to the destruction of low productivity of pasture and forage, in addition to the destruction of wildlife habitat and disrupts the ecosystem in this dynamic part of the kingdom. This resulted in severe loss of forage production across the rangelands, damage to rangeland wildlife habitat, loss of wildlife and disruption of captive-breeding programs for endangered species. Subsequently, the government of Jordan started its action plan to restore and rehabilitate the damaged ecosystems. 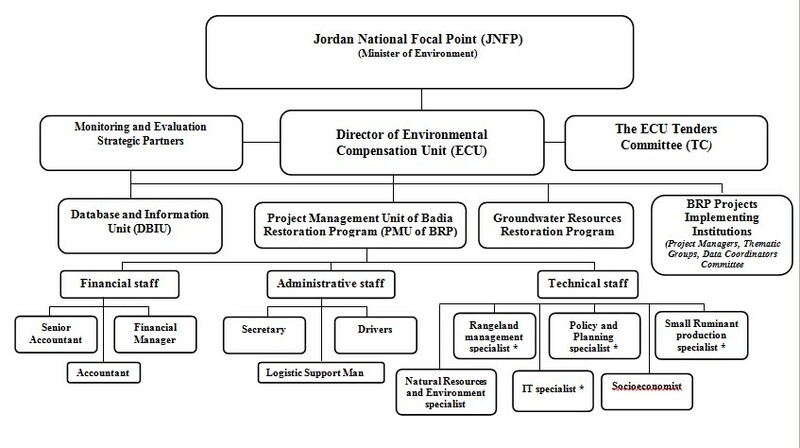 In response to the UNCC decisions, the Ministry of Environment (Jordan National Focal Point (JNFP)) established the Environmental Compensation Unit (ECU) and identified its structure. The main program for ECU was the Badia Restoration Program (BRP) and its Project Management Unit (PMU). During the early years of the program, the PMU worked jointly with national governmental institutions and UNCC to set up the structure of ECU and to start the activities of BRP, as identified and monitored by the UNCC. The ECU structure (Shown in the diagram) enabled the PMU-BRP implement the action plans for restoring the degraded ecosystem of the Badia after carrying out baseline surveys and preparation of community action plan (CAP).